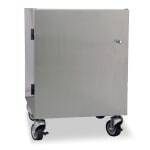 The Stoelting 4177350 floor stand has a steel frame that provides structure for the cabinet, while its stainless steel exterior is durable and resists minor damage. The hinged door easily removes for cleaning and replacing, and the knob's tension is adjustable. Casters are fitted to the bottom of the stand, enabling you to easily move it as needed. This stand is perfect for establishments that do not have countertop space to fit frozen beverage machines. Your machine will stay in place since it bolts to the top of the stand. The Stoelting 4177350 floor stand can be used with the CF101, VB9, O111, E111, F111, E112, F112, E122, F122, E131, F131, F144, and SF144.